Have everyone come in their pyjamas and bathrobes. Get some products for everyone to try, or ask everyone to bring one item. Have some towels, water and an area that can get wet! Make up a pitcher of mineral or spring water – add in cool cubes & some lemon or cucumber slices. Have some fashion or teen beat magazines to talk about fashion trends & celebrity gossip. Get some plastic buckets or mini tubs to soak feet in & take turns giving each other pedicures. Add some funky polish & decals to the toes. Have some nice body lotions for the finishing touch. Take turns giving each other a manicure – try funky combinations, 2 tone nails, & rhinestone decals. Do some of the skin tips on Fit For A Feast. 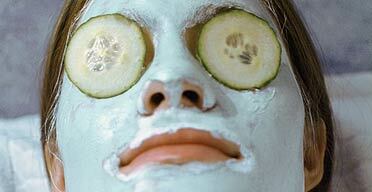 Give each other facials by spreading a face mask – avoiding the eye area. Put on a deep conditioner and let it work its magic under a shower cap or towel. Style each other’s hair after – try braiding or elegant updo’s. Have extra bobby pins, clean combs and elastics on hand. Try some of the makeup tips you find on Fit For A Feast. Be a fashion judge or jury and decide what lipstick or eye shadows look best with each guest’s coloring. Get some extra make up brushes from the dollar store or some Q-tips so everyone can share the makeup (and still keep it clean – use a new applicator any time you share). Get some make-up remover and pads or face wipes for the end of the party. If you are giving loot bags, make them up with beauty product samples, loofahs, lip gloss, body sprays etc..